Shenzhou is China's manned spacecraft; its name means 'Divine Vessel.' Shenzhou is similar to Russia's Soyuz and was developed with assistance from Russian space experts. Like Soyuz, Shenzhou consists of a descent module containing the main crew cabin, a service module containing the craft's retrorockets, and an orbital module for conducting scientific experiments. Only the descent module returns to Earth. Unlike Soyuz, however, the orbital module contains its own propuksion system and can remain in orbit, unpiloted, to conduct research. 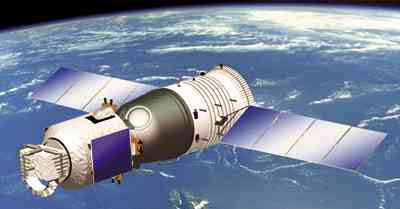 Four unmanned test flights of Shenzhou were conducted from 1999 to 2003. In October 2003 Yang Liwei piloted Shenzhou 5 on the first manned Chinese spaceflight. More Shenzhou missions are planned likely leading to the construction of an orbiting space station.